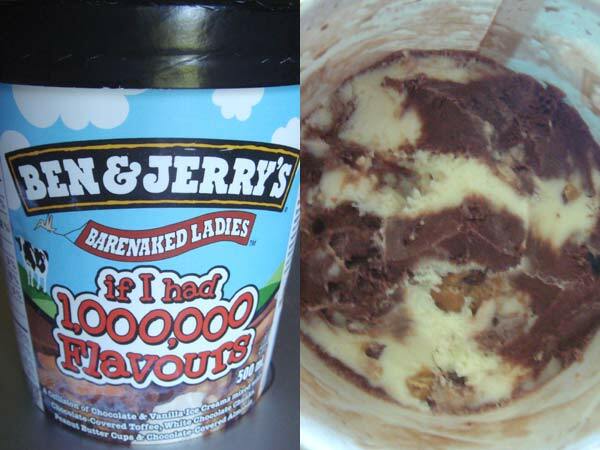 Ben and Jerry's 'If I had 1,000,000 Flavours' from the outside and inside. After seeing media coverage here and here of the new ice cream flavour ‘If I had a Million Flavours,’ I knew I had to try it. Described as chocolate and vanilla ice cream with peanut butter cups, chocolate covered almonds, chocolate covered toffee and white chocolate chunks, it seemed to be a chocolate and nut lover’s paradise (read, heaven for me). It also doesn’t hurt that the Ladies are donating their cut to support the ABC CANADA Literacy Foundation. While I didn’t think it would be out yet, I got lucky and found it on a hunt of the local grocery store on the May long weekend. And boy was it worth it, despite big price tag (nearly $7 for the tiny tub) and the hefty 300 calorie count per half cup. I personally think it could do without the white chocolate, but I guess they wanted to keep all their chocolate flavours covered. So if you’re a chocoholic like I am, it might be worth a try of this super-rich ice cream. If you like ice cream, and boy howdie! do I, never ever ever worry about the cost both to your wallet and your waistline. There’s just not enough time in this lifetime to consume all the ice cream we should. I like the way you think sir!